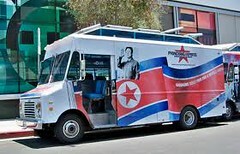 Now that our cities streets are being frequented more often by taco trucks, and cupcake trucks, why not expect to start finding trucks with something really useful, like fresh fruit and vegetables? 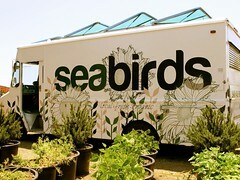 Although not the typical food truck, we have found a truck to profile that was truly designed to help its community. Experts call Detroit a food desert since more than half of its population must travel at twice as far to reach the nearest grocery store as they do to a fast-food restaurant or liquor store. Detroit’s limited public transportation makes it difficult for those without cars to get to farmers markets or suburban stores, and decades of population decline (from 1.8 million in the 1950s to half that now) have made most neighborhoods in the 138 square mile city too sparse to support corner produce stands. Those who have studied the city state that people in developing countries have much better access to fresh produce than Detroit’s residents. The lack of fresh food has become a public health problem in Detroit. In a neighborhood which is has a ratio of 26 liquor stores to every grocery, a community group has found a way to sell fresh fruits and vegetables like ice cream. This group is taking a fresh approach to the problem and, it’s bearing fruit. Five days a week, the Peaches & Greens truck winds its way through the streets as a loudspeaker plays R&B and puts out the call: “Nutritious, delicious. Brought right to you. We have green and red tomatoes, white and sweet potatoes. We have greens, corn on the cob and cabbage, too.” The truck is set up like a small market and brings affordable produce to families on public assistance, homebound seniors and others who cannot reach the well-stocked grocery chains in the suburbs. 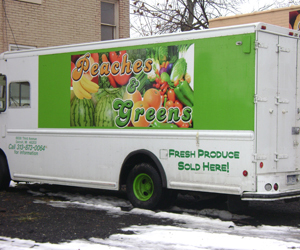 Lisa Johanon, executive director of the nonprofit Central Detroit Christian Community Development Corp., which runs Peaches & Greens, started to investigate the idea of a mobile produce truck as a way to get fresh food into the kitchens of Detroit residents. After navigating her way through Craigslist, she was able to locate a used UPS truck for the low price of $5,000. With the help of volunteers and donations of paint, shelves and a table-top refrigerator, the vehicle, which once sported the UPS logo, was converted into a colorful collage of bananas and watermelons. Their prices are very reasonable. A single banana sells for a quarter and an apple for 50 cents. Compare that to a $1 bag of potato chips or $1.50 can of pop, and it’s hard to argue with the truck’s cost and health benefits. “When kids don’t have a proper diet, their brains are sluggish and they don’t perform nearly as well at school. Buying an apple or an orange is a treat for kids because they are not used to having it. To them it is candy,” Johanon explained. 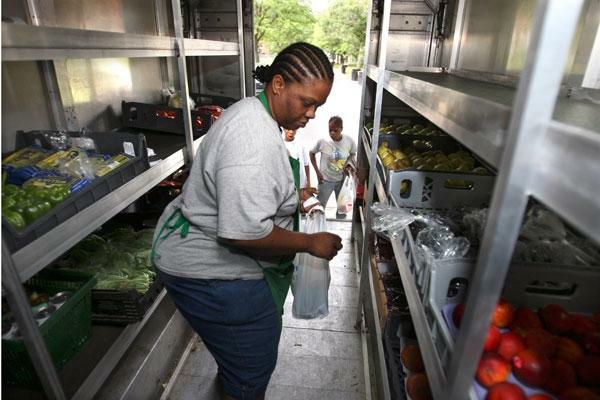 The truck operates Tuesdays through Saturdays and is stocked and driven by employees of Central Detroit Christian Community Development Corporation. Johanon purchases the inventory twice a week from two local sources: the Detroit Produce Terminal and Eastern Market, as well as maintains an urban garden where produce is grown and maintained by the groups volunteers. The nonprofit organization that funds the truck, the Central Detroit Christian Community Development Corporation, also runs a storefront where they offer cooking classes in addition to selling produce and other healthy staples like grains, beans and dairy products. Together, these collective initiatives are trying to transform a city from a barren food desert into a community where the pounds of carrots and plums outnumber the pop cans, beer bottles and fast food items.